If you want something to look nice and sound good, these aptX and AAC-supported ‘buds should be on your wish list. We’ve been seeing plenty of true wireless earbuds lately. Yeah, that technology is neat and convenient, but it isn’t always the most reliable wireless option. In fact, it’s hardly ever the most reliable wireless option, at least as of now. But the Sennheiser HD1 In-Ear Wireless are a pair of comfortable neckband-style earbuds that are aptX and AAC-compatible and ready to accompany you anywhere for a competitively priced $149.99. Who are the Sennheiser HD1 In-Ear Wireless for? Like most Sennheiser products, these are for listeners who appreciate the finer things in life. Sound quality is paramount, but a touch of style goes a long way. Sennheiser borrowed design elements from its Momentumline of headphones and earbuds, and the same attention to detail in those models can be found in the Sennheiser HD1 In-Ear Wireless. The premium sheepskin leather is soft to the touch and is complemented by the vibrant red stitching. The Sennheiser HD1 In-Ear Wireless earbuds are a neckband style earbud that are comfortable and flexible, both of which are great for all-day use. Due to the compact form of wireless earbuds—yes, even the neckband variety—these are great for commuters who aren’t drawn in by the novelty of true wireless earbuds, and who don’t care for the bulk wireless headphones. Though 10 hours may not be an exorbitant amount of battery life, it’s good enough to get most of us through a week’s worth of commutes before needing to top up. When you purchase the Sennheiser HD1 In-Ear Wireless earbuds, you get a molded, zipper carrying case that’s similar to the Plantronics Voyager 6200 UC; a micro-USB charging cable; and three pairs of ear tips. How are Sennheiser HD1 In-Ear Wireless built? The first thing you notice about these earbuds is the gorgeous, soft sheepskin nappa leather and stitching across the flexible neckband. 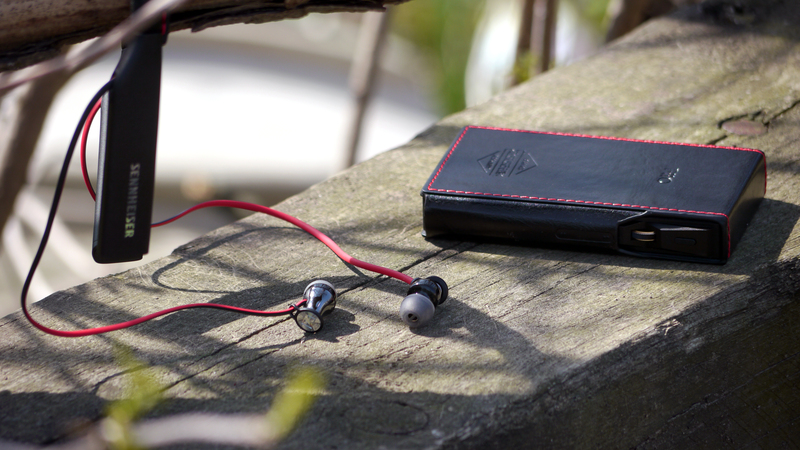 The red threading and cable accents provide a bit of flair without compromising the chic design of the HD1 earbuds. On the left wing of the neckband, are playback controls,a power button, and omnidirectional microphone. The nappa sheepskin leather feels supple and is elegantly accented by the vibrant red stitching. Each stainless steel earbud rocks a mirrored chrome finish, and they’re complemented by the impact-resistant polycarbonate elements. Though the earbuds look and feel great, it would have been a more convenient feature to add some kind of magnetic or retractable functionality. Due to the somewhat fragile materials and lack of IP rating for these earbuds, you should use caution when working out in them. It’s do-able, but perspiration will quickly erode away at the leather. Not to mention that a bit of moisture and bad luck can lead to short circuiting. The playback controls are easy to access from the left wing of the neckband. The on-board, omnidirectional microphone sounds all right. It does a better job at isolating your voice from ambient noise than something like the Optoma NuForce Be Sport4, but there’s still room for improvement. When in a noisy coffee that had a sound meter reading of 74dBA, some background din was picked up, but it was still easy to hear what I was saying. Although, it doesn’t hold a candle to the Plantronics Voyager 6200 UC, the mic is perfectly fine for everyday use and even some professional calls. Skipping or going back to previous tracks requires you to press and hold either of the volume buttons. On the left interior of the neckband, there are three buttons for playback control, and the center button can be used to access virtual assistants like Google Assistant and Siri. Since they’re separate buttons that have about 1mm of separation between each one, it’s easy to differentiate between all of them. This was useful when biking around town; I never fumbled around to pause or skip a track. Speaking of which, track control is a little odd in that it requires holding the volume up or down button, not double-tapping the center button. Just something to note. It only takes 1.5 hours to go from zero to 100 percent, but Sennheiser reports a battery life of 10 hours, which isn’t great for a pair of neckband-style earbuds. For reference, the RHA MA750 Wireless have a reported playback time of 12 hours and the Plantronics Voyager 6200 UC have a reported playback time of 16 hours with active noise cancelling turned off. The earbuds take about 1.5 hours to complete a full charge cycle and are then able to provide over 10 hours of playback. Although 10 hours isn’t groundbreaking, it’s worth giving the Sennheiser HD1 In-Ear Wireless ‘buds props for having a battery life of 10.13 hours with a constant 75dB output. This is about as loud as you’d want to go, and we certainly don’t recommend exceeding this for any extended period of time. This means that if you lower the volume, you may squeeze out 10.5 or even 11 hours of playback. As with most modern devices, connecting is quick and easy. You can either enter pairing mode by holding the power button for three seconds, or just tap your NFC-enabled device to the logo on the left wing of the neckband to bypass your phone’s Bluetooth menu. Once connected, you have a 10-meter radius before things start to get crackly. What’s more, Sennheiser doesn’t explicitly state this on the box, but the headphones are multipoint compatible, meaning that you can stay connected to two devices simultaneously. The cable ports serve to protect the flat, dual-colored cable. I hate audio-visual lag. Is latency an issue with the HD1 In-ear Wireless? Since these are aptX and AAC-compatible, there’s virtually no perceptible audio-visual lag. When I was binge watching Nathan For You, I didn’t experience any awkward delay. Another perk of these Bluetooth codecs is their ability to stream higher quality audio from the source device to the headphones. In the case of aptX, this relays CD-like audio straight to your ears, which is more than good enough for most of us. How do the Sennheiser HD1 In-Ear Wireless sound? A bass-heavy sound signature is par for the course with consumer audio products. Like the Momentum line, these earbuds play favor to low-end frequencies and reproduce a weakened treble response. If the majority of your listening centers around lo-fi beats, hip-hop, rap, and even pop, you’ll enjoy the slight bass bump. Though there’s a dip in frequency response from 3kHz-6kHz, the sound is generally neutral. If you’re worried about that dip, you shouldn’t be. Due to the nature of sealed in-ear design, Sennheiser has been known to try to engineer away common resonances (think “ringing”) that happen when you seal an ear canal, and that may be what’s going on here. Other sites have confirmed this feature, but it’s not really a cause for worry. As you can see, the low-end reproduction is fairly emphasized relative to the treble. Midrange frequencies like vocals receive a similar amount of emphasis and are easy to separate from bass frequencies. Isolation is good; during our objective testing, we measured an average isolation of 11.69dB SPL. These earbuds do a decent job negating noise between 100Hz and up like that buzzing refrigerator that you need to fix, or the chortling baritone taking up too much counter space at the coffee bar. In all fairness, effective isolation is highly dependent upon a proper fit and seal. If the included ear tips aren’t a good fit, we highly recommend investing a few extra bucks into Comply memory foam ear tips. In Good As Hell by Lizzo, the kick drum that enters at 0:12 doesn’t feel exaggerated, especially since the midrange frequencies also receive about the same emphasized treatment. It’s easy to hear Lizzo’s vocals above the kick drum and A-G-Fm piano chord pattern. Though it doesn’t seem that there’s much masking happening between the mids and lows, the lows do overpower the vocals during the chorus when Lizzo belts, “And do your hair toss…” at 1:27. Right when she says “hair toss,” the kick drum is hit and “hair” becomes less audible than listening with the 1More Triple Driver On-Ear headphones. The mids are an interesting beast with the Sennheiser HD1 In-Ear Wireless. By just looking at the frequency response graph, you may think that they’re about as prominent as bass frequencies. Though this is partially true, the vocals sound loud but occasionally lack clarity. The headphones are portable and sophisticated. Simple by Florida Georgia Line is like most pop-country songs, lyric-dependent and guitar-based, making it an excellent case study for the earbuds’ midrange reproduction capabilities. The basic Am-C-F-C-F-G chord progression difficult to hear over the instrumental chorus, and Brian Kelley and Tyler Hubbard’s harmonies lose dimension in the din. The earbuds really struggle with relaying a transparent sound, and instrumental separation is just OK.
What’s more the banjo, which has a fundamental frequency range of 110Hz-800Hz is nearly inaudible throughout the song. During an instrumental remission from 1:56 to 2:04, the banjo is easier to hear, but picking of the high-G, B, and D strings isn’t as clear as it is with the RHA MA750 Wireless. Though, it’s worth pointing out that this midrange clarity issue could be a result of a loud recording that was affected by the dip in frequency response; this is where many instrumental harmonics fall under. Cory Wong rocks out in Jax, an instrumental-only groovy ballad that’s predominated by the electric guitar and accompanied by a variety of instruments including the drums, piano, trumpet, electric and bass guitars, and a synthesizer. The bass guitar and drums sound fantastic through the HD1 wireless earbuds, but the higher frequencies of the synthesizer fall short. That said, the highs fare better than the frequency response graph would lead you to believe. The trumpet harmonics, which oscillate between about 1kHz and just over 9kHz, sound much more prominent than I was expecting, interestingly, the reverberations of the electric guitar weren’t as emphasized with these as they are with my personal pair of RHA MA750i earbuds. Should you buy the Sennheiser HD1 In-Ear Wireless? If you like the neckband style and want something made from premium materials, yes. These earbuds are an excellent choice for any avid music fan who also appreciates a quality build… and doesn’t mind paying a bit extra for it. That said, since the price dropped $50 on Amazon from the original retail price of $199.99, these are a much better value. The sheepskin leather and attention to detail paired with the technical specs and compatibility with high quality Bluetooth codecs like aptX and AAC make these a good deal. The Sennheiser HD1 In-Ear Wireless earbuds are a great option for listeners who need something to look good and make them look good. Sure, some may rather have water and dust protection instead of leather materials but if that’s the case, then there are plenty of other options available to you. However, Sennheiser gets comfort, fit, and connectivity spot-on with these wireless earbuds. Yes, sound quality reproduction could be clearer, but it’s easy to overlook and the forward low-end and vocals will please most consumers’ ears. Even though these don’t provide you with the most accurate sound, they’re fun to listen to and sometimes that’s all you want. The flexible neckband is easy to forget about but is hard to exercise with. 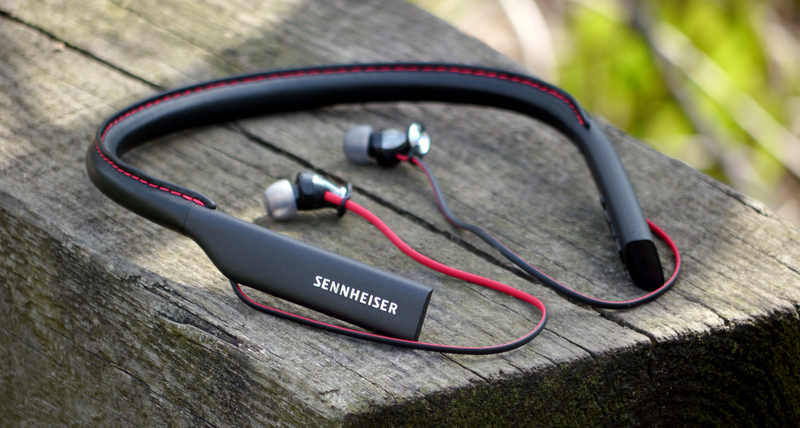 If you’re on the fence about the Sennheiser HD1 In-Ear Wireless, that’s understandable. Even with the price drop, $150 is a lot to pay for a pair of earbuds. That said, if you don’t mind the pricing but want something vegan-friendly without sacrificing high-quality Bluetooth codec support, check out the RHA MA750 Wireless. They’re constructed from 303F-grade stainless steel housings and include Comply memory foam ear tips to boot. Playback and volume controls are intuitive. Accessing Google Now or Siri is responsive. Maybe you’re thinking, “Hey, I really like the HD1 but I need something for working out.” In that case, click on over to the Under Armour Sport Flex Wireless by JBL. These earbuds have the same neckband design and have a sweat-resistant nano coating. They also feature an LED on the back to keep you visible on the road during night runs.